Where is my Haplogroup From? This is a very common question. The answer can be as simple as a Wiki search, or a little more complex, but offering a much more personal answer. First, if you have not joined a haplogroup project relevant to your haplogroup, do so. This applies to both Y-line and mitochondrial results. We discussed how to do this in the “What Project do I Join?” post. Joining haplogroup projects does two things. First, it provides you with a group of “like people,” who have common ancestors with yours. Second, it provides the project administrators with DNA sequences to work with. It’s that “working with” part that will play an important part in the answer to this question. If you’ve already looked at Wiki, and you’re ready for more, you can take a look at your personal page. 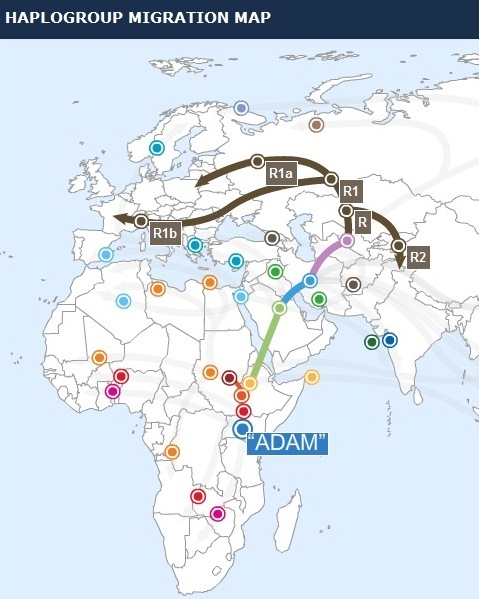 At Family Tree DNA, both the Y-line and mtDNA have a haplogroup Migration Map option. 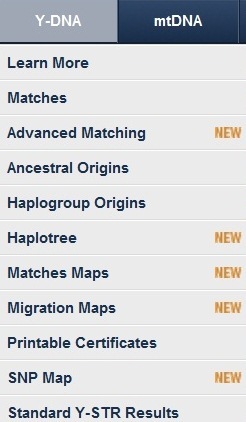 Clicking on this option shows you the migration map for your haplogroup. Clicking on the Haplotree option, and scrolling to the bottom, you’ll see a link for the Haplogroup FAQ, right under the “about my haplogroup” verbiage. The FAQ holds lots of information about haplogroups, how they are determined and such. For Ancestry customers, your haplogroup description is at the top of the “View Results” page. Clicking on the “learn more” provides you with an additional paragraph or so. Ancestry does not have haplogroup projects, SNP testing, or additional haplogroup tools, so the rest of this will refer only to Family Tree DNA clients. Let’s now turn to the haplogroup projects. The most personal answer to the question, “where did my haplogroup come from” will come from within haplogroup projects. How haplogroup administrators handle projects varies, based on their level of involvement, interest and experience of the administrator or administrators. And remember, we are all volunteers. Having said that, these people do an amazing and incredible job. 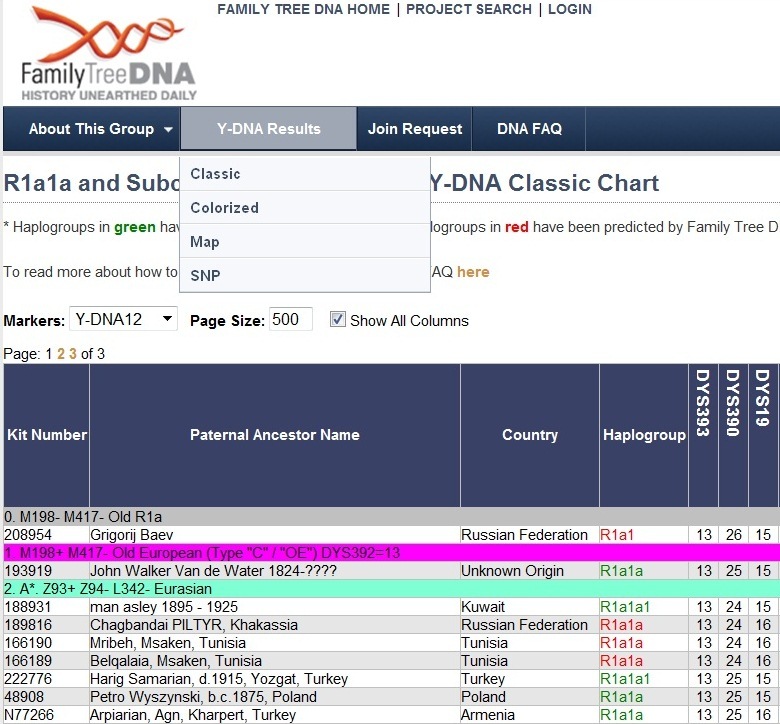 Family Tree DNA provides a mapping function, for free, along with their other project administration tools, for haplogroup projects. If a project doesn’t have a map available, then it’s because the administrator chose not to opt for the map when setting up the project. I’m using the haplogroup R1a1a project as an example. It’s well organized, grouped by haplogroup and many people fall into this haplogroup. The various options for viewing haplogroup projects are listed on the top bar within the project. Clicking on the “classic” options shows you the various groups that the administrator has created, and how they have grouped individuals within the project. By searching for you kit number, you can find the group you’ve been assigned to. Note that if the project extends over more than one display page, you may need to search on subsequent pages as well. You can also change the number of results displayed per page in the “page size” box at the top. Depending on the project, administrators group participants differently. 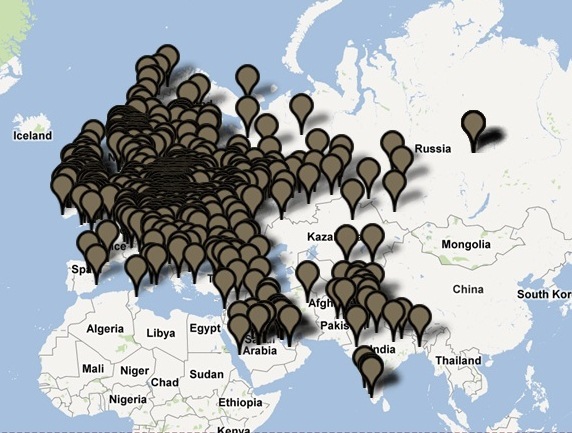 Some projects group people by geographic location. Most Y-line projects group them by haplogroup subgroup, or SNP, plus groups of STR markers within SNP groups. The SNP (single nucleotide polymorphism) is the location that is tested to see if you are a member of a haplogroup, or haplogroup subgroup. Your terminal SNP is the one furthest down on the tree that provides you with the most resolution as to where your ancestors were located. Your individual markers further refine SNP groupings. Projects have the option of displaying the location of the oldest ancestor. Of course, this means that each participant will need to have entered the geographic location of their oldest ancestor on the Migrations Maps tab on their personal page. 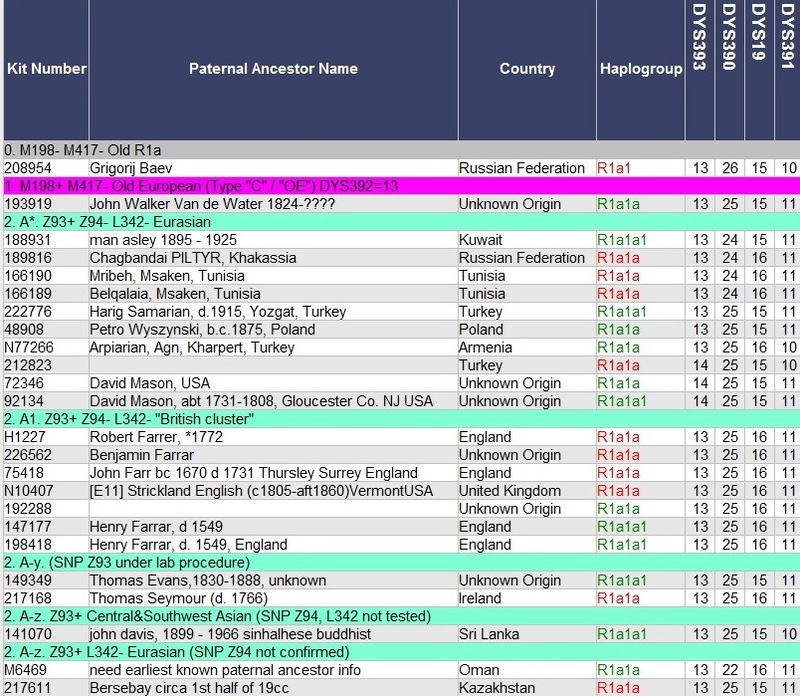 This is critically important for haplogroup project mapping, because without the locations of oldest ancestors, there is no way for your results to appear on the map. However, a much more personal answer to that question lies in the subgroups. The haplogroup R1a1a project has grouped participants by SNPs and has given the resulting clusters identification names. Let’s assume that your kit is listed in the group A1 which they’ve defined as Z283+, M458+, L260+ and named the “West Slavic Subcluster ‘A’” – all listed in the group title for this subgroup on the map selection. The numbers, Z283+ indicate the SNP name and the plus or minus indicates that the people in the group have tested that location, and if they have it (+) or not (-). If the administrator does not clearly define how they’ve identified the subgroups, then you’ll have to contact them directly. Every administrator runs their project differently. I also answer this question for clients, in context of their own ancestry and family history, when writing their Personal DNA Reports. This entry was posted in Haplogroups, Projects and tagged Introductory DNA by Roberta Estes. Bookmark the permalink. I’m in a Haplogroup project on FTDNA. My results are at the bottom of the page in the “ungrouped” category. What does that mean? I have the same problem and I have tried to contact the admistrator (of the project group I joined) for months with no answer. Mine is R1b1a2 but I am still in ungrouped. What’s up with that? I do realize admins are not paid but why be an administrator if you never answer/return emails? I have even questioned FTDNA and they say try contacting the Admin again. How many times is enough? They might have died.� How would Family Tree DNA or the project members know? I suppose you have to be paid up at ancestry to get the haplogroup information. Mine is not there. There is no haplogroup information at Ancestry – paid up or not.